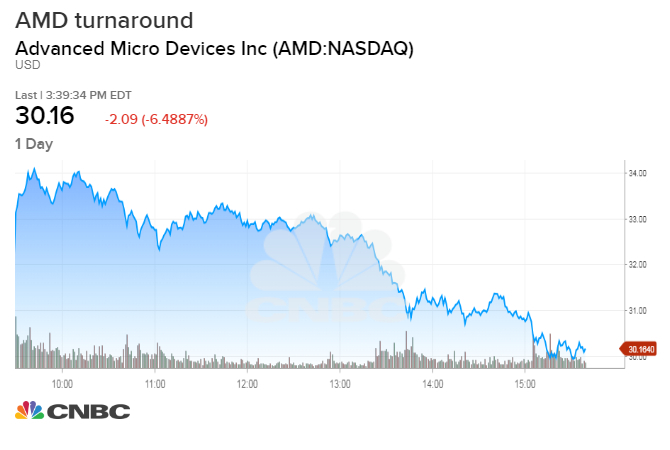 Shares of Advanced Micro Devices posted their worst day since July on Thursday as the popular semiconductor stock appeared to take a breather. AMD's stock sank 5.3 percent by the closing bell, finishing the day at $30.48, well below recent 12-year highs. The shares, which opened the day higher, rose more than 7 percent in the previous session amid Apple's latest iPhone unveil, an important annual event for Wall Street's top chipmakers. AMD has also been one of the hottest trades this year, up more than 50 over the past month and nearly 200 percent since January. "The semiconductors haven't been acting spectacularly and AMD was leading the group. I'd guess some people wanted to take profit," said Scott Redler, partner and technical strategist at T3Live.com. "It's a shot across the bow for anyone who trades momentum." AMD shares were the most actively traded on the S&P 500 index Thursday, with a volume of more than 301 million shares. Rival Micron was the second-most traded stock, though its shares finished up 4.5 percent. There were no apparent headlines for the AMD turnaround.